Key Chain – 1.26 oz. Key Chain – 3.16 oz. Key Chain – 3.04 oz. Peak LED flashlights deliver a powerful beam in a durable compact package that is sturdy and reliable. If you are looking for a flashlight that is easy to use, then the Logan 17500 series is the handful of light for you. Designed for the professional in mind, this flashlight has shock and water resistant epoxy sealed heads with unequaled light output to battery runtime. The twist on/off mechanism is the simplest and most reliable feature in the market today. These lights are built to thrive under the most severe conditions and survive where others fail. Peak lights are always at the leading edge of technology, using the latest in electronics and LEDs. The Logan 17500 uses Quantum Tunneling Composite (QTC) Technology for variable light output. This allows you to adjust the light output from a dim glow to the brightest single CR123 battery flashlight available. The QTC Technology also increases battery run times when maximum light output is not required. 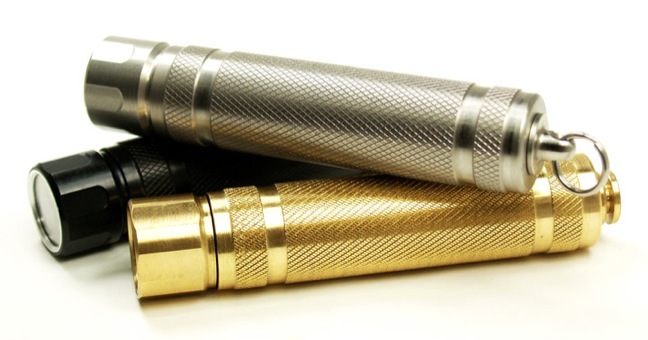 The optional battery compartment makes the Logan 17500 the first true ultra-high performance multiple size battery flashlight available anywhere. Maximum allowable voltage is 4.2 volts for the Logan 17500. An available battery adapter kit for the optional battery compartment allows the use of 17500, 14500, 10440 and RCR123A rechargeable batteries. CR123A, AA and AAA primary Alkaline and Lithium batteries and AAA and AA Nickel Metal Hydride rechargeable batteries can also be used.